Rick Gutierrez has been cracking up audiences across the country with his throwback takes on traditional family values and outlooks on marriage for years, and the industry is taking notice. His most recent special “I’m Not Mad, I’m Just a Parent” is currently the most requested special on NUVOTV and will soon be found on Netflix as well. His most recent success was spring boarded by an appearance on “Gabriel Iglesias’s Stand-up Revolution” on Comedy Central. Rick’s other television credits include NBC’s Friday Night Videos, BET Comic View and Showtime’s Latino Laugh Festival. 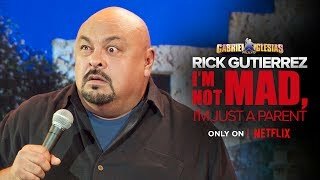 A writer, actor, and hilarious stand-up comic for over two decades, Rick is originally from San Antonio, but may be most at home when he's killing from the stage.